Get it now from DriveThruRPG! 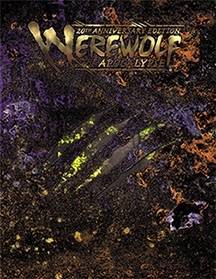 Werewolf: The Apocalypse roared into hobby games in 1992, inspiring a generation of fans to stand up and howl their defiance at a corrupted world in a battle they knew they were doomed to lose. WtA presented the Garou: creatures at once both man and wolf, and filled with a Rage against the evils that would destroy and corrupt both the natural and spirit worlds. Capable of transforming into a variety of forms and blessed with Gifts that enabled superhuman and supernatural powers, the Garou fought many foes, always knowing that in the end they would fall. But what stories would be told and what songs sang of their exploits! I pledged on Kickstarter for W20 and received a link to download the pdf preview but the last update on drivethrughrpg is dated 2013-04-29 and your news is more recent, how can I get the final pdf version ? Well… I ordered the Delux edition, hopefully I’ll be getting that within a week. You did an awesome job with this guys, it was VERY hard to surpass the v20, but you nailed it with this rendition of the classic Werewolf game, which feels powerful, definitive, and epic in theme and mood. I truly hope you will keep this level in Mage 20, my personal favourite from the classic World of Darkness Triunvirate, and also want to raise a question: shall we see 20s editions of Changeling, Hunter and Wraith? Especially the last one, Wraith is a game that NEEDS this. Cheers, Onix Path! We decided on W20 at GenCon 2011 after seeing V20’s sales. We decided on Mage20 at GenCon 2012 after seeing W20’s sales. We will doubtless decide on Wraith20 after seeing Mage20’s sales. Anything beyond that is too far down the road to be anything but speculation.